After another morning wakeup call, I was primed & ready to go. 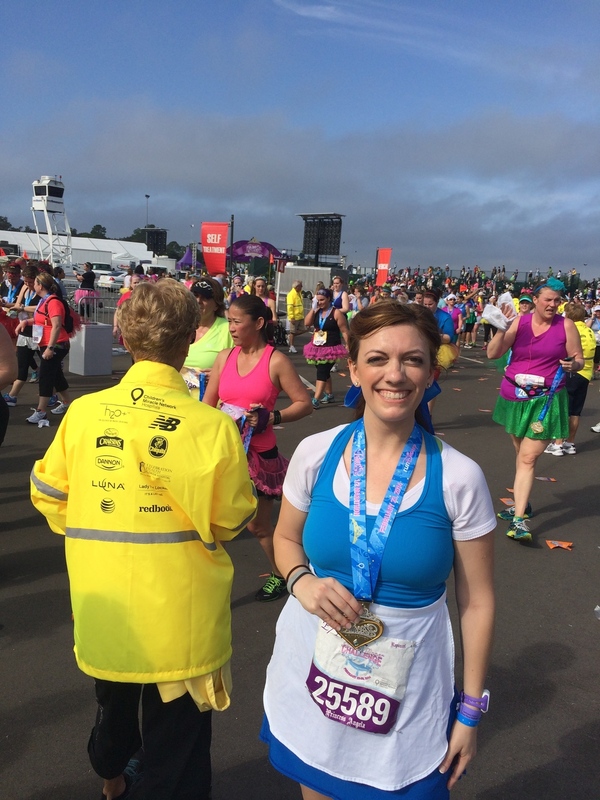 I put on my Belle “provencial” outfit and mosied on down to the bus area at the same time I did for the 10K. Quite different. A nice lady in a golf cart picked up 6 of us runners so we didn’t have to walk from the Little Mermaid to the Lobby area, but dropped us off just short, because the line was from the bus area, through the lobby, wrapped down by the Nemo pool and towards The Lion King. I’m actually not quite sure how long I waited. I guess that’s what happens when you have 25,000 runners versus the 15,000 from the day before. Once on the bus, there was traffic on the highway to get to Epcot, again not something during the same time the day before. I couldn’t imagine not using the Disney transportation and driving yourself. You’d have to leave well in advance. By the time we arrived, walked through the designated security areas, and onto the pre-celebration area, they announced it was time to move to the corrals. I think this was around 4:45; as the race started at 5:30 and it was about a 20-25 minute leisurely walk to where they were set up. They split A-H and I-P; I think I-P had to walk farther (thanks, Disney. Ha). The security checked to make sure you were in the right corral – though I’m not sure why you’d try to sneak into “N.” I did see two ladies, one in N and one in E. What a nice friend to move back. You’re allowed to move back corrals, but not move forward. I sat down on the ground after moving through some bubbles of people – they weren’t packed tight, but everyone was huddling in groups and I wanted to be as far forward as able. It was going to be almost a full hour (54 minutes) between the starting corral and ours, N, so I figured sitting down would be alright. They actually made us stand up with about 35 minutes left, even though we didn’t start moving for another 15. Fireworks gunned off every corral, and Disney kept to the minute of release times. I never endured the previous corral system at Walt Disney World, but it looked like this more-corral-less-people thing was working well. It wasn’t as crowded at the front as it could have been and there was a good distance between the start of Corral N and the end of Corral M.
It was misty for most of the race, thankfully, but for those of us that started later, and ran or walked slower, the sun did come upon us towards the end of our run. Despite being misty though, it was still muggy. Very muggy. Towards the end it was around 75 and 98% humidity. Someone told me RunDisney had extended the per mile rate of 16 minutes to 17 minutes to accommadate for the weather, but I’m not sure how true that is – haven’t been able to confirm. Would have to ask a balloon lady. I did not enjoy the weather. 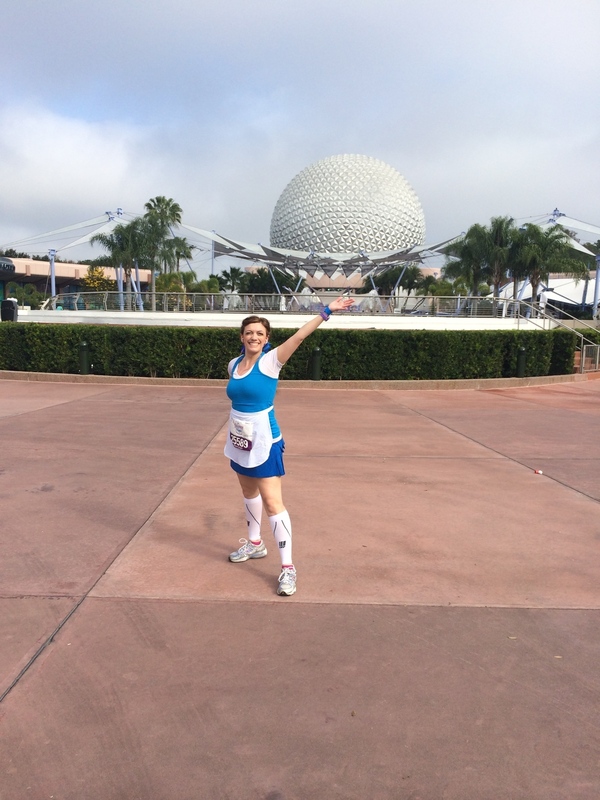 There was an on ramp that we went up near Epcot at about mile 2. At that point, the wheelchair frontrunner was going up the the opposite side, edging towards the finish. I heard, and it makes sense, that a female runner was before him, but we didn’t see her. We all rooted on the guy in the wheelchair as he raced by on his Mile 11, whereas we still had that many to go. Around Mile 2-3 Jack Sparrow & Captain Barbosa were out for pictures. The line was long, but I knew (from reading previous blogs), I’d be able to take pictures with them on the way back, around the same mileage (9-10). Same thing with the Good Guys (i.e. Aladdin, Hercules, Flynn Rider, Eric & John Smith). 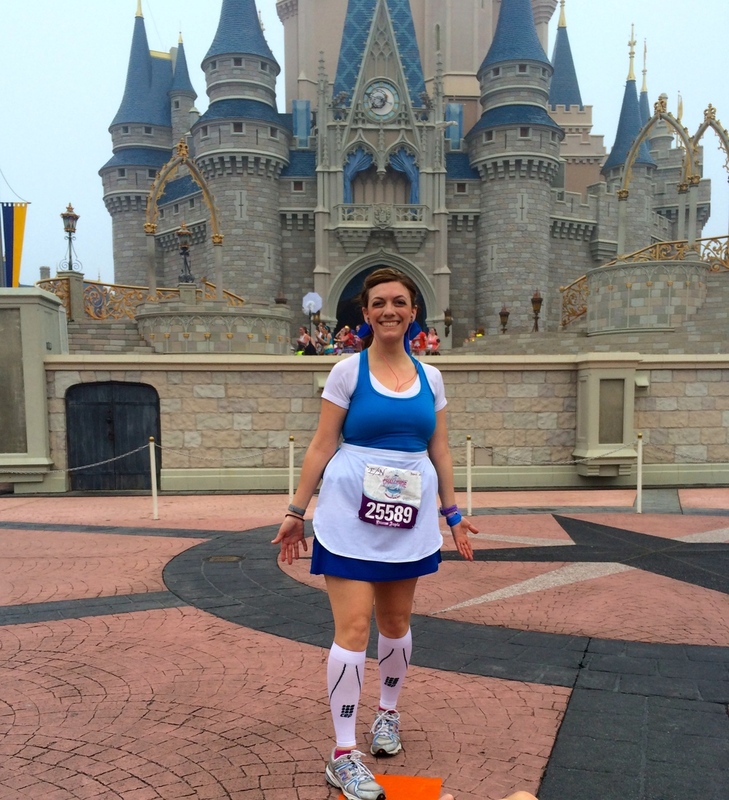 Dressed as Belle, I pushed myself for the first few miles, knowing I’d want to stop for Belle & Gaston in the new Fantasyland; and for a picture in front of the Castle; and depending on my bladder, a bathroom break. I thought I’d walk a good deal of it by that point because of the heat, but wanted to make sure that I gave myself enough lee-way. I was waiting no matter how long those lines were. Next up I could see the Villanesses on the right side of the road (not in median, so probably meaning they wouldn’t be out for the opportunity for pictures on the way back). And while my eyes might not have seen everyone, I only saw two villains. Previous years have had 6 – at least I’ve seen pictures with six (Maleficient, the Snow Queen, The Queen of Hearts, Lady Tremaine & Anastasia & Drisella). This year, I saw Maleficient, the Snow Queen and large Mirror. Nada else. I wasn’t stopping, but slightly disappointing to see that downsize. A couple race car drivers next to 2 cars near the speedway were out – I forget which mile. I’m not sure if they were just “dressed” in costume, or if they were famous drivers. I don’t really follow racing at all. I imagine they were jus the Car Experience employees. Once we passed approximately mile 5, we were going under a bridge near contemporary that I remember reading about. Only a short bit until the Magic Kingdom. We ran through a backstage area for about one minute before seeing a door open on Main Street, and we were down Main Street and into Tomorrowland. Unlike Disneyland, Main Street is open for visitors (the park was not open officially yet, but Crystal Palace was for breakfast, and people who had bought the cheer squad I think could come in, too). So, one side of the street is for runners and one side of the street is for visitors/cheer squad. This made it quite crowded to run down Main street. I much preferred the completely bare street with no runners that Disneyland has. Granted, it’s nice to have people cheering you on, but not when they take up so much room & kind of “ruin” the experience of running down the center of the street and seeing the castle in the center ahead of you. Plus, people were seeing loved ones and cutting each other off to run to the family member for a picture. Or stopping completely when they saw someone. Not the best race etiquette – but only possible because of this cheer squad. We turned the corner into Tomorrowland and towards the back Buzz was awaiting visitors. His line was not too long. Just around the corner, going into Fantasyland, the White Rabbit was also out – he only had about 5 people in line. I think most people didn’t know he was there because he was just coming back from a “break.” While I know the characters need to have their breaks – enjoy their carrots and all, check the time, make a pie – I think there should be some designation of who is where. If the character is not out when you run by, how are you to know they are available at all? That’s why his line was not very long, I suppose. Just around the corner, a very, very long line with Mickey & Minnie. There was a person out here available when I asked who the line was for. I’d estimate if I had gotten in line I would be waiting 10-15 minutes. It was that long. But I had plans – Belle should be next. And I continued and looked; and no Belle. And no Gaston. I can’t express how disappointed I was. Totally deflated that they weren’t there when they had been there the previous year. That was the only character I wanted. Alas, I continued on (obviously) and we were going through the Castle. There was a stop here before moving through, because it was a narrow path and everyone was taking pictures of the back of the castle. I don’t think anyone (at least where I was standing that I could see) ran through the castle. All walking. Once through the castle, people picked up pace a bit. I stood in a (short) line to get my picture taken in front of the castle once we weaved through. The couple behind me were kind enough to take my picture & I reciprocated. The official photographers took one, too. Though, I’ve seen some people who had the whole Castle in view, the top 1/3 is pretty much cut off in mine. So while I’m very happy to have a Castle pic, it’s not the best. Heading back towards Frontierland, we passed by Woody (I think) & over a Train track with the Magic Kingdom Train & a Conductor available for pictures. Then, before you knew it, we were backstage. So that was what – maybe three fourths of a mile at most inside the park. Backstage, Snow White & her Prince were taking pictures with a large float. I’ve read other posts that Princess Aurora & Prince Philip were out, so they must have switched every 30 minutes. Once out of backstage we ran along a long stretch of road. Just before the Grand Floridian there was a picture opportunity with 3 men in tuxes holding a glass slipper on a pillow. Another stop as we were passing was with Mary Poppins, Bert & a Penguin. Continuing on, the Polynesian came into view and Lilo and Stitch were out for pictures. Just past them, Genie & a Mickey golf cart were also available for pictures. Then came the long stretch of road with absolutely nothing. I believe around Mile 7 there was a stereo blaring “Let It Go.” It was also at this point that course seemed to narrow, but I’m thinking it was the same as it was when we ran past the Grand Floridian. Around mile 7 there was a runner down. As I went past, it looked like she was unconscious & other runners were attending to her; while myself & many other runners (while still continuing on the course) tried to flag down a medic. Security was flagged down & I’m hoping a medic came shortly after. I wasn’t really certain what to do in this situation. There were about 4-5 other runners already attending to her. I felt bad & wanted to stop, but if all runners had done that, we would have clogged the course. I do hope she was able to get the attention she needed. Around Mile 9 there were 2 groups that were also on the way into Magic Kingdom: The Princes and Jack Sparrow (and his ship). The lines were much shorter now, but I still didn’t stop. Though, it was nice to know that option would be there in case I didn’t want to stop at the beginning but did later. At that point, I just wanted to finish. The boring course continued until around Mile 10 where we started to have to do inclines. A curved on ramp, and a couple overpasses took us through the next mile before going into Epcot. I walked these, as there was no way at this point, in this heat, that I could run up a hill. We did have Sarge from Toy Story urging us along these ramps. We ran in the front door of Epcot past bystanders and people actually going into the park (it was 9am by this time and park-goers were going about their day). I saw a cute sign that I enjoyed that said “Hurry up, we want to eat.” Knowing how good the food at Epcot is, I understood their frustration. Once in Epcot we ran through a backstage area where Princess Sophia was out for pictures. Then, into the park and I stopped for a restroom break. I didn’t have to go, actually, at this point, but knew if I waited I would have to use a Port-o-pottie in the reunion area and the Park restrooms are so much better. Back on track, we ran all the way to the entrance of the World Showcase and turned around back towards the front of Epcot. Through another backstage area, past a Gospel Choir, and we were in the home stretch. I was so happy to finish. I did have fun, but not as much as I was expecting, nor as much as I had at Tinkerbell. It was a combination of the heat and the inconsistencies that Run Disney had with last year’s princess race. I guess I shouldn’t have assumed they’d have the same characters out, but I really expected more princesses. It was a Princess Half Marathon after all. It did; however, feel really good to get the bracelets cut off my wrist and receive 3 medals at once. They were so lovely. 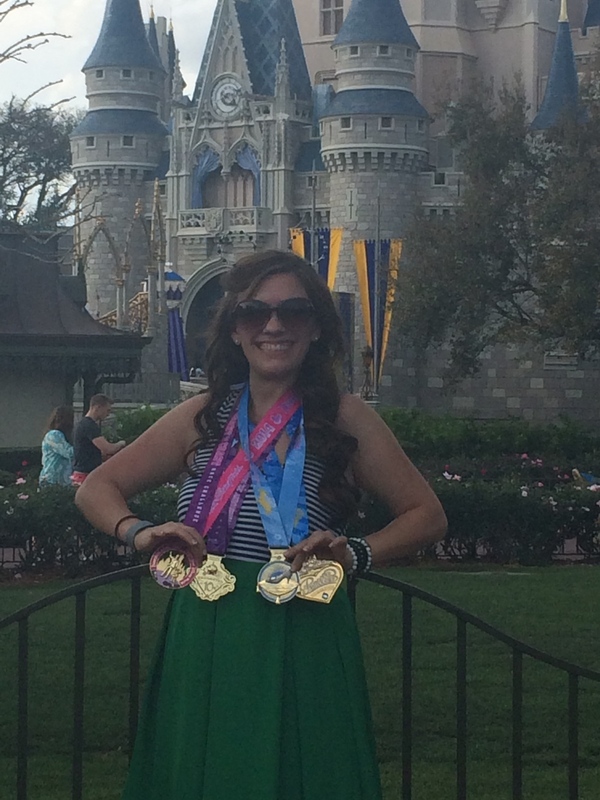 Half Marathon, Pink Coast to Coast and Glass Slipper Challenge. I had finished. Thankfully. I was excited for the reunion area – as Belle had been out previously. But, as I approached, Ariel was out and the line was closing. Thanks, Run Disney. Us slower runners, who may/may not be able to stop along the course for pictures, do not even get any in the reunion area? This perplexed me. In addition to, why have the most princesses (a total of 4 – Cindrella, Rapunzel, Belle & Ariel) AFTER you finish? The reunion area is open not just to runner, but specators & friends and family. You didn’t have to be a runner to get in line. Why not put these princesses along the course? It seems like I’m complaining...and I am. There are many things I do not think Disney got right on this one. I’ll post the pros and cons below. -The inconsistencies of characters (no Belle & Gaston – can you tell I’m annoyed)? -Princesses in the reunion area leaving even before the 3:30 time had past for last corral runners. -The amount of time actually in the parks – both Backstage and inside, I would say was only a mile and a half. 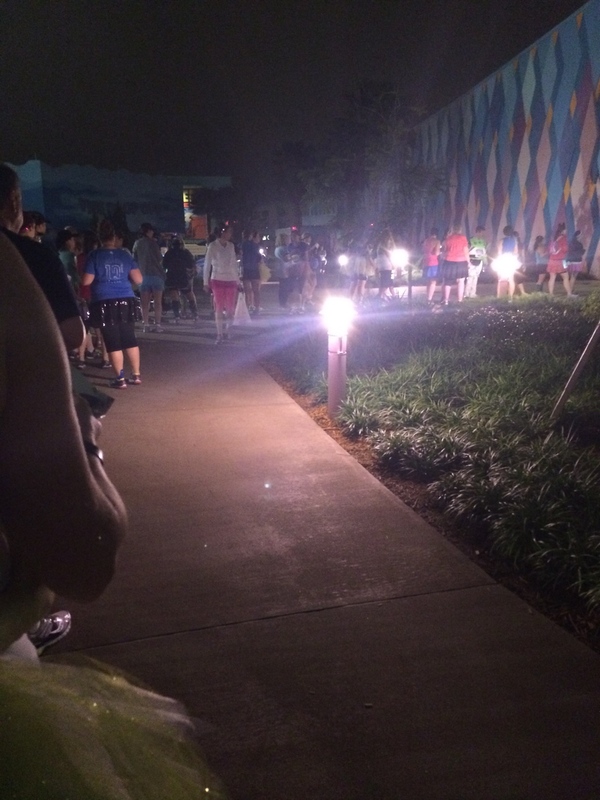 -Requiring runners to be in their corrals by 5am. And the last corral not starting until closer to 7am. That’s a long time to wait. I’m not sure what the answer is here – as they’ve already spread out the corrals. As I’ve mentioned in my previous posts; do not think I did not have fun because of all the sour words I have to say. I did! I just know there’s always improvements. And having Tinkerbell to compare the Princess to, I also could see more things I liked and did not like. Look for a post comparing Disneyland to Disney World when it comes to racing, too. There was no cupcake truck that I could find (boo) and the bus line took about 40 minutes to go through and get on to head back to the resort, so I was a bit more Grumpy & Sleepy than Happy & Dopey when I was finally back to my hotel room. I had a good rest, and headed back to the park later. Stay tuned for that post...here's a picture preview!